Songs Since hearing David Archuleta’s holiday album Christmas from the Heart, I have been curious about one song in particular. I had never heard this song before. That is, until I listened to David’s version! Singing in Spanish, he sounds as if he has been a native speaker of that language all his life. David has reported that Spanish was his first language as a small child. Both of his parents are of Latin heritage, especially his mother Lupe who was born in Honduras. I am sure this is one reason why he is able to sing in Spanish with expert pronunciation. However, David has also admitted that he lost much of his ability to speak Spanish as he grew older. You would never know that, because David does such a wonderful job singing this song. According to the Encyclopædia Britannica, villancico consisted of two parts, beginning with the refrain, or estribillo, which alternates with the stanza, or copla. The copla has two parts, the mudanza and the vuelta. The vuelta rhymes with the last line of the mudanza but is sung to the melody of the estribillo. This overlap of poetic and musical form is characteristic of the villancico. This carol was one of the more widely known works in Medieval times. Beginning in the 17th century, the poetic text became sacred, connected in some aspect with Christian principles or beliefs. Today the term villancico refers to the Spanish Christmas Carol. Translations vary in order to better understand the song’s original archaic words and meanings. Some believe that the writer of “Riu, Riu, Chiu” is anonymous, and its text may have been originally written in Portuguese, but others think the song may have been written by Mateo Flecha (1481-1553). Mateo Flecha was a Renaissance-era Spanish composer noted for his ‘ensaladas,’ a sort of eclectic vocal form, usually incorporating humorous verse, with a reference about Christmas. The melody for “Riu, Riu, Chiu” most likely dates back to the fifteenth century or earlier. 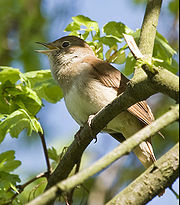 The main theme of the song as sung by the “nightingale” is lively and rhythmic. With its appealing blend of Renaissance-era elegance and peasant-like festivity, “Riu, Riu, Chiu” is a catchy, memorable tune. The words tell of the Blessed Mother Mary and her son Christ, the Redeemer, and the way God protected them from Satan, the wolf! Here now is David singing “Riu, Riu, Chiu” from his album Christmas from the Heart. I have provided the lyrics he sings below, so you may follow along. ‘Riu, riu, chiu,’ cried the nightingales by the riverside. God kept the wolf [Satan] away from our lamb [the Virgin Mary]. but the more powerful God knew how to protect her. and this Virgin did not even have original sin. Christ the Patriarch clothed in human flesh. Although he is immortal, he made himself mortal. And in our time we have seen it fulfilled. and man raised to heaven because God loved him. because he came to make himself equal with man. Have a great week everyone and as always, take care! Another great story about the wonderful songs David sings! thank you. I hope we’ll get to see David perform “Riu, riu, chiu” LIVE. I love the guitar at the end. Thanks Katie, I love this song and yet I didn’t know anything about it until now. The lyrics are beautiful! Katie mi amiga tan dulcita! Excellente!! This was such an infomative article and I know you have enhanced the enjoyment of this song for many of David’s fans including me. He does sing beautifully in Spanish and I am sure his family is very very proud. I was also curious about this song, Katie. I’ve wondered why David chose this particular song to add to the album. I wonder if it was a song he grew up listening to and singing with family at Christmas or if it was new to him and chosen simply to add variety. Maybe someone will ask him about it at a VIP on his Christmas tour. amazing breath control keeps perfect pace with the fast tempo. Thanks Katie!